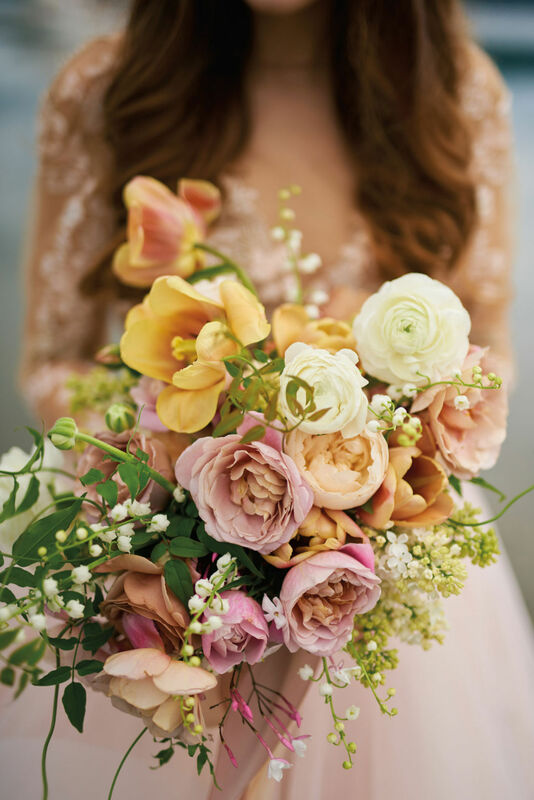 This bouquet, created by Carey Wendel of Bleedfoot Florals, is lush with garden roses, lily of the valley, jasmine, ranunculus, lilacs, Koko Loko roses, and Distant Drums roses. “I wanted it to be very full and soft, almost entirely made of flowers for a romantic and fresh-from-the-garden feel. 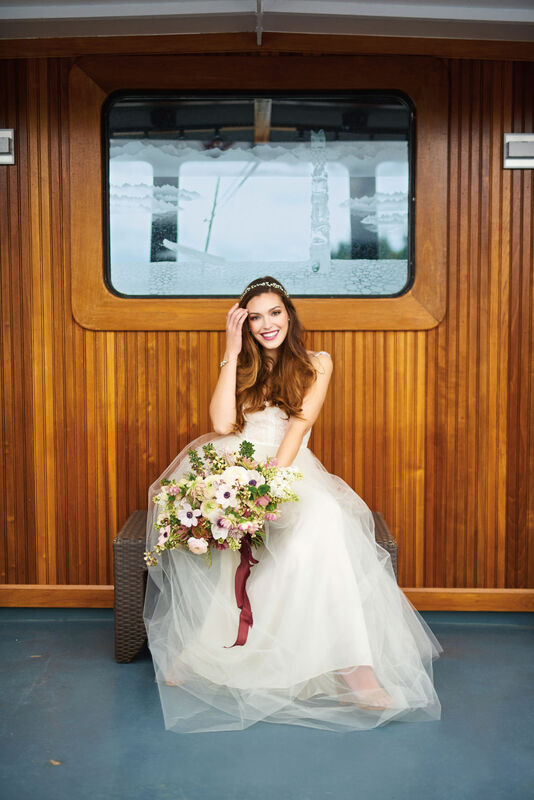 Muted blushes give this bouquet a feminine but sophisticated touch, while the lily of the valley keeps it sweet and sentimental,” she says. Freya watercolor tulle gown with beaded bodice ($3,600), Elizabeth Dye. Rhinestone leaf earrings ($85), Melinda Rose Design. Rose gold vintage bridal ring set by Memoire (call for pricing), Alvin Goldfarb Jeweler. 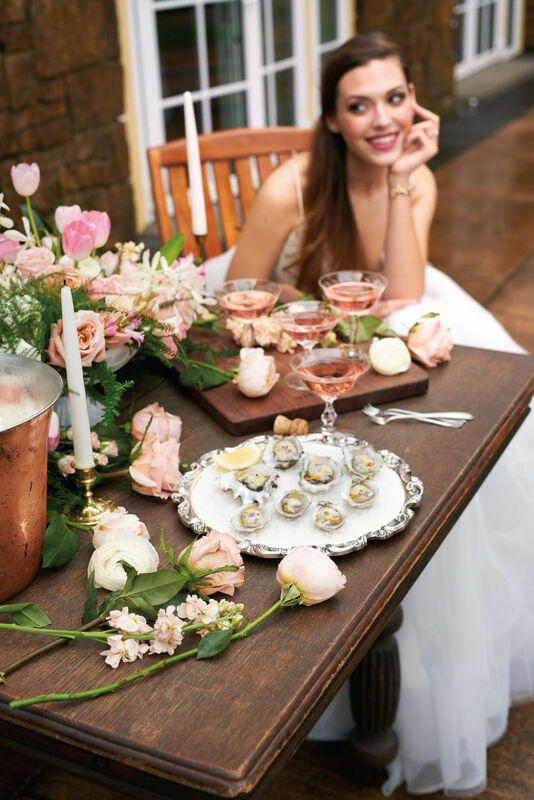 Sara Jane Camacho of Thatch Floral takes inspiration from a singular botanical and builds a bouquet off what would best showcase that particular bloom. In the case of this bright beauty ($365), she was inspired by the wily quality of arugula stems that had gone to seed in her garden, mixing them with ruffled hellebores; white, mauve, and picotee ranunculus; white lilac; white spirea; cobra lily; and blush anemone. “My garden is partly shaded, so the arugula was reaching and twisting in ways to reach the sun that created some wild shapes. Each stem was a testament of the hardwon struggle for light and life,” she says. The result is a fresh palette with an earthy patina, paired with hand-dyed merlot ribbons by Of the Earth. 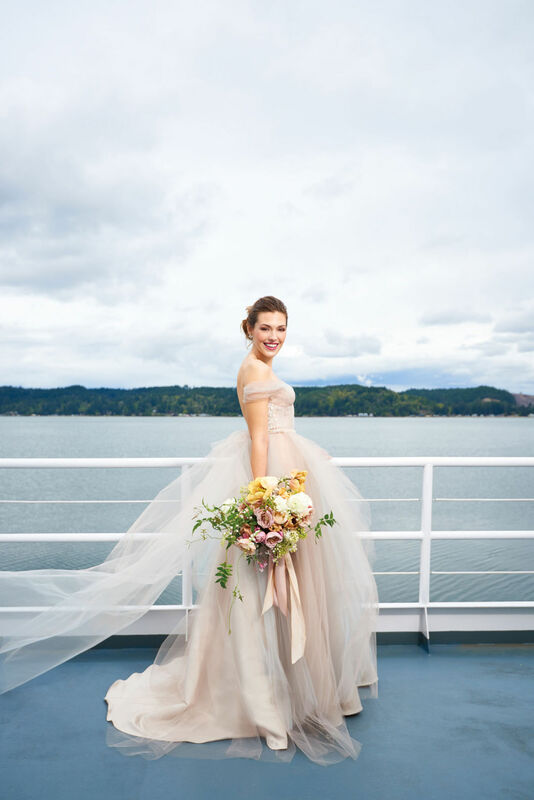 Jubilee lace and tulle ballgown ($2,000), Twigs & Honey. 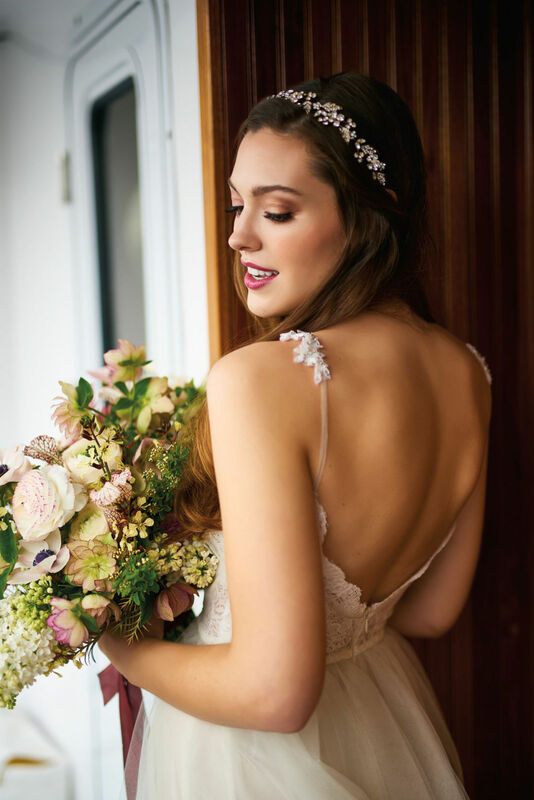 Gold crown by Bel Aire Bridal ($138), Calla Bridal. Rhinestone leaf earrings ($85) and rhinestone leaf bracelet ($185), Melinda Rose Design. White gold ring (price upon request), Alvin Goldfarb Jeweler. Consider choosing one large element—like this gorgeous, full king protea—to build a loose, oblong pageant-style bouquet. This one, from Rachel Roth at Sugar Pine, also features ranunculus, Juliet garden roses, spray roses, tulips, clematis, plumrose fern, honey myrtle, Shimmer rose, and hyacinth ($295). Cupcake lace and tulle skirt ($1,625) with velvet waistband in blush and Taffy skinny-strap bodysuit ($795), both Twigs & Honey. Handwired crystal comb astilbe flower headpiece ($225), Melinda Rose Design. Bijou dress by Hayley Paige ($3,910), The Dress Theory. Bougainvillea bracelet ($135), Melinda Rose Design. Large wooden cutting board ($118), Make & Stow. Champagne coupes ($1.50/each), silver forks ($1.25/each), and silver tray ($10), Vintage Dish Company. Candlesticks (call for pricing), Sugar Pine. Copper ice bucket (call for pricing), Lewis & Levy. 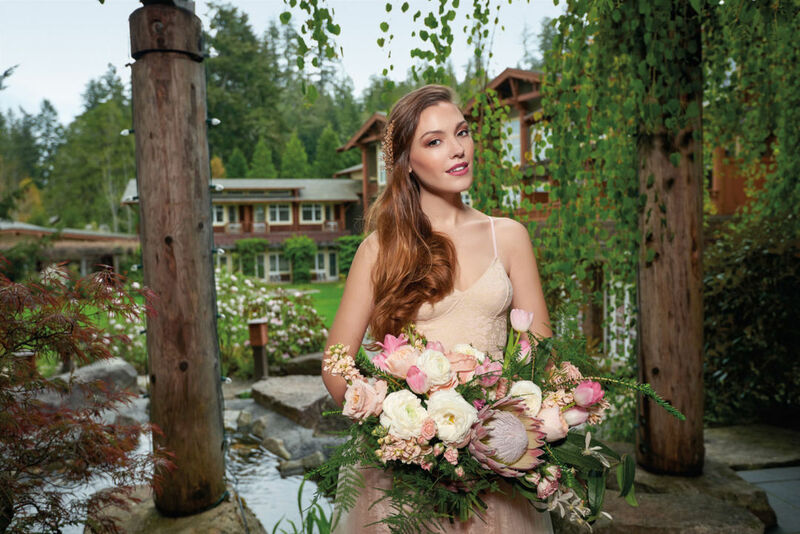 Be it mountain views, waterfront, or wooded trails, Union’s Alderbrook Resort & Spa has all the magical outdoor elements for a picture-perfect Washington wedding. The property features 77 guest rooms, 16 cottages, and more than 7,000 square feet of indoor and outdoor space (including a private yacht, the Lady Alderbrook!) Enjoy everything from oysters snagged right off the beach to relaxing spa treatments. Packages start at $2,500.